Your story might begin like this: One day you feel some pain in your lower back. You ignore it and attribute it to something you did earlier in the week, or earlier in your life. And then one day the pain moves and travels down and across your buttocks. Another week or month go by and the pain has now traveled down the back of your thigh, or even as far down as behind your knee. It wakes you up at night. It kills you when you go from sitting to standing and the pain prevents you from even walking or doing your favorite activities. Welcome to your Sciaticia Syndrome. 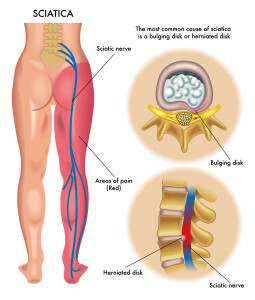 Unfortunately, with sciatica, the longer your ignore it, the worse it becomes. To understand how to find relief from this syndrome, you must acknowledge its causes. The primary cause of this syndrome is two-fold: first is too many hours of sitting and second is the weakness in the most important muscle that supports your back and posture: your gluteus muscles, or your buttocks. The weakness occurs as a, result of all your sitting activities progressively over time. People most susceptible to sciatica can be found sitting for prolonged hours at their desk in front of a computer, or in their car commuting for hours.Even those who are physically active and work-out will not be ale to overcome the debilitating effects of sitting. An hour of exercise at the end of the day can’t make up for many hours of sitting each day. Being in a bent, seated position for hours each day creates excessive pressure on the front part of the vertebrae in your lower spine. This pressure compresses the disk between the vertebrae which over time can begin to bulge out the back. When a disk bulges out, it hits a nerve. In the case of sciatica this nerve root is typically located at L4 and L5. The sciatic nerve travels out of your spine and down your legs. You can feel pain from pressure on this this nerve anywhere along that path. The more you sit, the weaker you become and the further down that path the pain will travel. The first step to finding sciatica relief is to correct your bad habits immediately so that the pain does not travel further. This means changing body positioning for good. Less sitting and more movement. The second step is to begin to perform therapeutic exercise movements and integrate them into your every day activities. 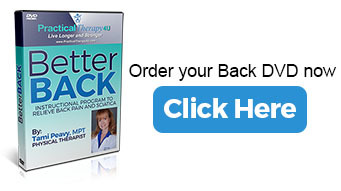 I have combined a unique program to teach you these movements on my “Better Back DVD” specifically to help you relieve sciatica pain and keep it out of your life forever.